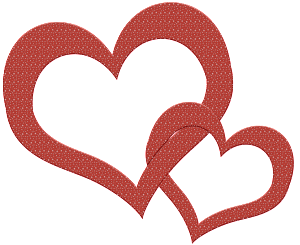 Hope all of my readers have a wonderful Valentine’s Day! Enjoy! By now you’ve probably seen the Doritos Super Bowl commercial. If not, I’ve linked it for you below. What you may or may not have heard is that NARAL, one of the pro-abortion camp’s most prominent groups, didn’t like it. So, let’s talk about this for a minute, let’s break down the stupidity of this tweet. It’s true. From day one pro-life advocates have argued, correctly, that a baby conceived between two humans and carried in a human mother is indeed human. I’m not exactly sure how you can humanize something that is clearly, factually, scientifically, biologically already a human, or why this would be a bad thing. It would be akin to someone complaining about a Purina commercial because the dogs were portrayed a little too “canine”. Of course, I suppose if you have worked tirelessly to dehumanize this class of humans, the idea of someone trying to confirm their humanity in such a public way might anger you. But it doesn’t change the fact that a human “fetus” is in fact human. It’s a fact, not an opinion. Fact. Scientific fact. ** side note** found out today that the ultrasound used in the commercial is the actual ultrasound (plus some animation magic) of the creator’s youngest child. The human boy’s name is Freddy. NARAL’s probably gonna have a fit if they find out this filmmaker had the nerve to humanize that “fetus” by naming it. I’ve asked several people their opinion of the dad in this video. Not one said they saw him as clueless. The words most used were “funny” and “hungry”. One person expounded on their view of him as funny by saying he seemed like a jokester. So, a guy who likes to have fun. Not one person said anything that even remotely came close to him lacking intelligence. 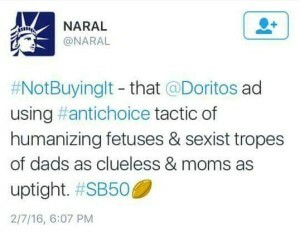 I find it interesting that NARAL is trying to call Doritos out as being sexist by saying they thought the dad was portrayed as clueless, yet in my very informal polling, they are the only ones who think that. Seems to me like perhaps they are the ones with a bit of prejudice in that regard. Again, I took the same informal poll of people’s opinion of the mom in this video. Not one came anywhere close to “uptight”. Most common responses were “pregnant” and “frustrated”. Well, I suppose frustrated might come a tiny bit close to being uptight. Tiny bit. But if any of you have ever been in your last weeks of pregnancy, you may recall a tad bit of stress, possibly some anxiety that might put you a bit on edge and a little more ready to react to your jokester husband’s antics. I think it’s sexist to conclude that such reactions are “uptight”, and find it funny that again it is NARAL who is making the prejudices against it. So there you have it folks. One of the most prominent pro-abortion groups in America doesn’t understand the fundamental scientific fact that a human baby is in fact human, and assumes jokester dads are clueless and hugely pregnant moms are uptight. What an idiotic, sexist statement. First of all, the fact that she is currently being investigated for everything from security leaks to public corruption by our own federal government makes me completely bewildered that she would dare to run for any office at this point, let alone President. 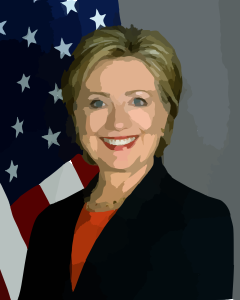 Personally, even if I did think she would make a great President (I don’t), I couldn’t in good conscience vote for her until this investigation was complete. These are very serious allegations, and so far evidence appears to be pointing to her guilt. Not understanding security clearance of communications is not someone you want to be in charge of the country. 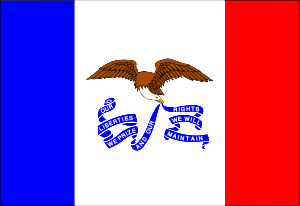 Someone guilty of public corruption is not someone I would want to be in the top office. In my opinion, it’s absolutely ridiculous that she’s even running during these investigations, and I would seriously have to question anyone who was aware of this and still chose to vote for her. But down to the issues. Okay, issue. For me, the fact that she is pro-abortion is an immediate ‘no’ vote. But not only is she pro-abortion, she is one of the most extreme supporters of abortion that I have heard of in recent years. Lastly, there’s the whole Benghazi issue. Again, some very serious allegations here. At this point, I honestly don’t even feel the need to look at the rest of her record or issues. These three things are so serious, and cast her in such a negative light, that there is no reason for me to even consider her as a serious candidate. You were once one of my top picks. Tied for second in my eyes. Your campaign lied to voters to sway caucus-goers to leave Ben Carson and side with you, CNN has refuted your claims that campaign workers were just relaying publicly reported news, and now we have time-stamped voicemails showing that your campaign was calling caucus workers after both CNN and the Carson campaign stated publicly that he was in fact staying on the campaign trail. It’s dirty politics. Politics as usual, yes, but that’s not exactly what we’re looking for this time around. I agree with you on so many issues, but this dirty trick and the continued lies trying to justify it, have left a bad taste in my mouth. And then I find out about the mailer controversy, and that while you claim to support first responders you refused to support the Zadroga Act… you’re falling farther and farther down my list of choices. You are no longer anywhere near the top of my list Mr. Cruz, not when there are several very well qualified candidates still in the running. For those who are interested, Dr. Ben Carson is currently my top pick, with Mr. Marco Rubio my second choice. More than anything, I wish abortion supporters knew that we love them. Yes, we love the babies we are trying to protect. But we love the moms too. Our movement is founded on and infused with love and respect for all life, including yours. Whether you have had an abortion, thought about it, or support the legal right to it, we love you. I wish you fully understood our side of the story. I wish you could see yourselves with the loving eyes thru which we see you. I wish you really heard what we are saying, and what we hear when you speak. I think sometimes the fact that you don’t is our own fault. Sometimes we become so passionate about the tiny little helpless ones that our passion comes out in ways that are less than becoming. Or as is so often the case whatever the topic, big or small, passion is often interpreted as anger or hate. But it’s not. I promise you that. I am passionate about saving babies. But I am also passionate about loving everyone involved, the best that I can, the best way I know how. I wish you knew that. I wish you knew that when you tell us abortion should be readily available because many of those children would otherwise be born into poverty, that we believe being poor doesn’t make you less worthy of life, that wealth doesn’t make your life any better. We don’t believe poverty, or the possibility of poverty, should equal a death sentence for anyone. I wish you knew that when you tell us abortion should be readily available because many of those children would otherwise be born into abuse situations, that while it also breaks our hearts, we also believe people can rise above abuse situations, can break the cycle, can live wonderfully fulfilling lives past terrible periods in their lives, have value, can lead happy lives, and can make the world a better place. We don’t believe abuse, or the possibility of abuse, should equal a death sentence for anyone. I wish you knew that when you tell us abortion should be readily available because many of those children would otherwise be born into neglect, that we believe those children deserve a chance to overcome their beginnings, and that we believe a neglected child can grow into an amazing influential person that can change this world for the better. 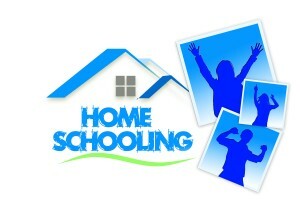 We believe that child can teach every one of us how to be better parents, better people. We don’t believe neglect, or the possibility of neglect, should equal a death sentence for anyone. I wish you knew that when you tell us a woman shouldn’t be forced to have a baby because she can’t handle being a mother right now, that we don’t believe you. We don’t believe she is too weak or incapable. We believe that she is strong, she is capable, she can do this. We believe in every woman and her ability to do hard things and come out better for it. I wish you knew that when you tell us a woman shouldn’t have to put her career on hold because of a baby, that we agree with you. But we hold accountable those who are guilty of pregnancy and maternal discrimination in the workplace, not the innocent life she is considering ending. We believe that baby is evidence of and a reason for fighting workplace discrimination, not an inconvenience to be discarded. We believe working women can fight the fight, do hard things, be a mom, and have a successful career. I wish you knew when you tell us that baby probably won’t be loved, that we don’t believe you. We believe everyone, if given the chance, will experience love in their lifetime. Because someone is not feeling loved right now does not mean they will never be loved. Beyond that, we believe our Creator loves each and every one of us more than we can imagine. Each and every baby is loved. We believe everyone deserves the chance to feel love, even if it’s not right now. We believe that not feeling loved, or the possibility of not experiencing love right away, shouldn’t equal a death sentence for anyone. I wish you knew that when we say we think abortion clinics should be held to higher medical standards, we say it out of love. Things like doorways wide enough for an ambulance gurney to fit, at least one doctor with admitting privileges at a local hospital, well, we believe these are safety issues for anyone having any type of surgery. What we’re trying to say is that if you do decide to go thru with the abortion, we at least want you to come out alive & well. We believe that making a choice we disagree with shouldn’t come with a heightened risk of medical complications, just to make it easier or cheaper. We value your life more than convenience or money. I wish you knew how much we loved you and how much we want good things for you. And yes, for your baby too.